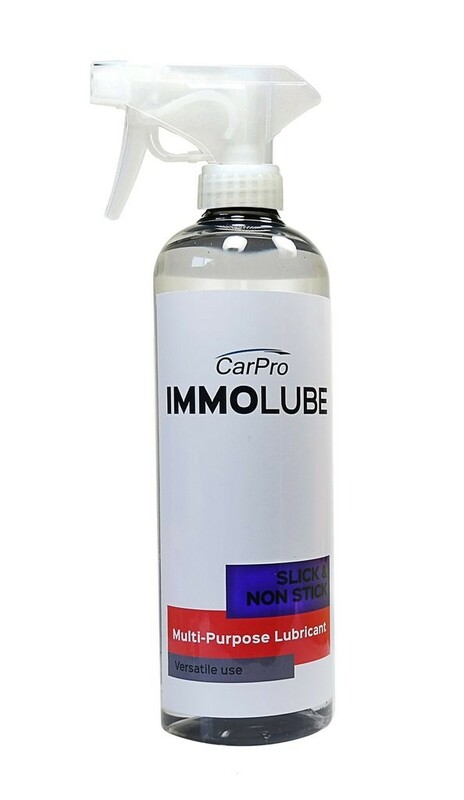 ImmoLube was designed primarily to aid the sanding and denibbing process for CarPro Immortal however it works exceptionally well as a clay lubricant for clay bars, or the polyshave products such as mitts, blocks and pads and also an extremely capable polishing pad lubricant to extend working times of compounds allowing the abrasives to break down further leaving behind less marring from heavy cut compounds which means less time refining. ImmoLube is a special mixture of surfactants and solvents made for reducing friction while sanding, polishing or claying painted automotive surfaces. Its slick, non-stick formula offers the perfect viscosity to reduce unwanted digging, and marring without clogging up sanding discs or polishing pads. Immolube has no protective polymers and no gloss enhancers in it which can be difficult to remove from the surface or cause clogging of pad surfaces. ImmoLube works wonders while using sanding discs for spot repairs or denibbing and is an excellent partner for priming your polish pads. Spray over the sanding disc, polishing pad, or clay bar and over the work area. While claying, sanding or polishing keep surface lubricated if it starts to dry. Wipe off any renaming residue and wash the vehicle again with CarPro Reset shampoo.